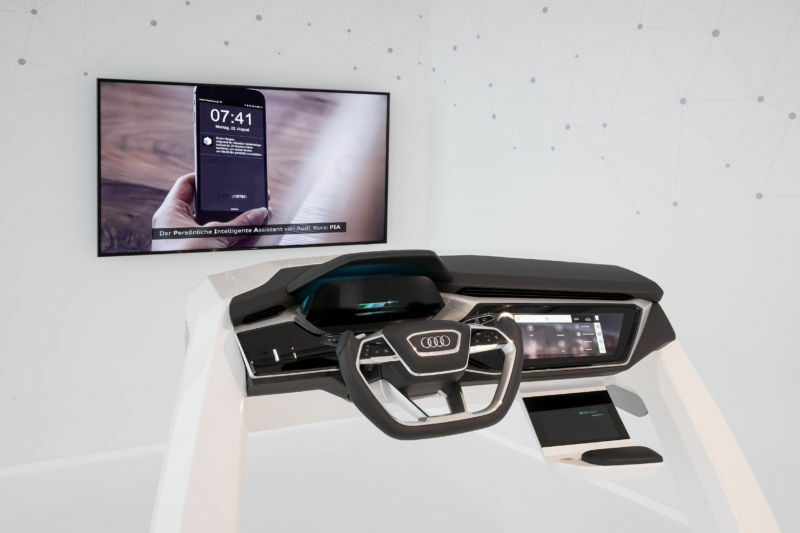 MUNICH—The recent tech extravaganza put on by Audi didn’t just involve virtual reality. The Ingolstadt-based OEM also had plenty of automotive UX bits to show us, from infotainment systems found in its latest vehicles to ideas for a future in which your car plays a central role in organizing your life. Obviously these future developments are built off the hope that the cars will be connected. Yes, we know many of you hate the idea of connected cars. But in addition to relatively obvious benefits for the end user—things like preventative maintenance alerts—connecting cars also means Audi will be able to benefit from the same approach that Tesla has been using to better understand the needs of its customers. And, in this case, we’re relatively confident in saying the automaker is taking issues like privacy and security seriously. Up until 2002, the user experience within an Audi—or any car, really—was a conventional affair. We got radios, then CD players, and eventually navigation systems and some vehicle function controls (think changing from Normal to Sport mode and so on). Then MMI—short for Multi Media Interface—came along, and all that stuff was unified into a single infotainment system that has steadily been improving over time. 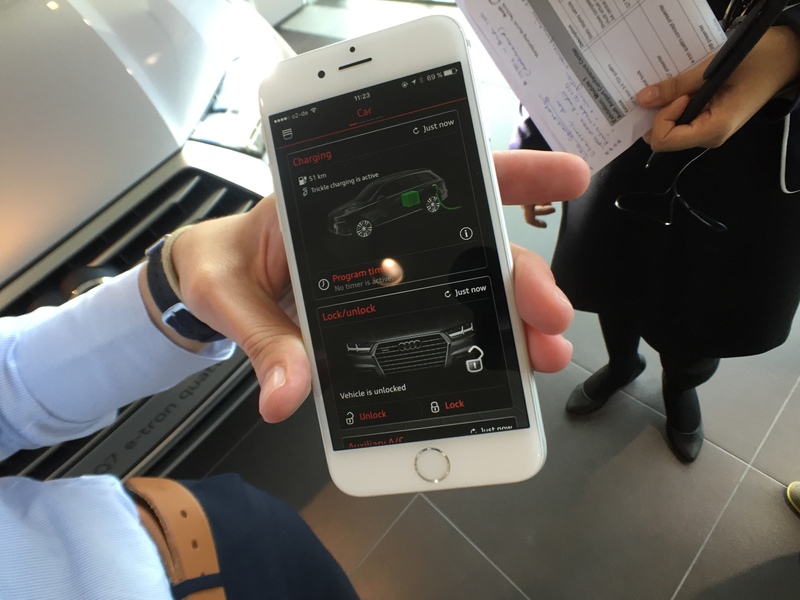 Audi’s latest MMI is built on the same underlying MIB 2 platform shared across the Volkswagen Group. In our opinion, the MMI is one of the best systems out there (along with Volvo’s Sensus and BMW’s iDrive), particularly since Audi changed the scrollwheel behavior to conform to a population well conditioned by Apple’s original iPod. MMI now has a connected car app that lets you do a number of things remotely, from checking your car status (are the windows or doors open, how much fuel do you have, are you approaching a service interval, and so on) as well as remote locking and unlocking. In the Q7 e-tron quattro—a hybrid model we are sadly not offered here in the US—the MMI also does things like turn on the AC and check charge status. Like other OEMs—and we’re thinking of General Motors and its new OnStar mobile app—Audi wants to make using your smartphone to send maps, music, or internet radio to your car as easy and seamless as possible. Audi’s future plans will build on this kind of functionality, morphing into what the company calls the Personal Intelligent Assistant, or PIA. Think of PIA like your car mashed together with Cortana or Siri. Once the PIA gets to know you (via the trend du jour that is machine learning), it will tell you when to leave the house for the daily commute, remind you to turn on the car’s defroster if the weather is bad, and even suggest calling home if it knows traffic will make you late. Once a driver joins the program, an additional data recorder is installed in the vehicle. Data from the car’s bus network is not accessible from the connected infotainment system. Roughly 850 different bus signals (out of ~7,000 in total) are harvested from each car and sent to a secure backend. The data is broken up and pseudonymized on the servers, so determining which employees are in which cars will be impossible. Plenty of cars with connected navigation systems from providers like Here and INRIX are already doing that sort of thing with road conditions. But Audi’s program extends down to the level of which buttons or switches get used most often. In the months since the program has been active, that equates to around 400GB of data and seven billion data records (about 500 signals per second per vehicle). Examples of insights derived from the batch data have already shown things like A6 and A7 (S6 and S7) drivers having more acceleration than those who get the sporty TT as their company car, something that chassis setup engineers can use to suggest chassis or setup tweaks. And data on driving behavior (and specific roads) is also valuable for developing autonomous driving, something that Tesla has found out to great effect. Even the ergonomists are in on the action, since they can determine which buttons or switches get the most use. Outside of Audi, the aggregate data can also be used as a cheaper way of doing market research for partners like radio stations and mobile network providers (i.e. coverage maps and signal strength). The data can also feed weather patterns and road conditions to municipalities. Customers will be able to do predictive servicing, ordering spare parts in advance or sending telemetry during a breakdown to let the recovery service know whether a car can be repaired on-site versus having to be towed away. By now, I imagine our more privacy-minded readers have steam coming out of their ears. To that end, Audi says it’s taking the issue of data privacy and security extremely seriously. Audi is already using end-to-end encryption between its connected cars and its backend, which it told us is constantly updated to remain state-of-the-art (although Audi’s representatives didn’t elaborate on the specifics). Within the vehicle, the bus separates safety systems from the infotainment. “No one in the industry can claim 100 percent protection, it’s not credible,” an Audi spokesperson told us, “but different efforts are being taken to give optimum protection against hacking.” The company’s service provider regularly conducts pen tests, we were told. Audi’s reps were also questioned on the company’s stance on data requests from law enforcement. Right now that’s not possible as part of the pilot phase, and while the company said that it must cooperate with criminal investigations, in most cases the data is broken up such that the program doesn’t know which driver is in which individual car.